It’s a crazy time of the year with manufacturers and vendors all competing with hype, persuasion and hope, to get you to pick up their new equipment, try out their new golf ball and fit yourself into a new golf shoe. All of those purchases require a solution. A solution is something that offers you a definite improvement that works for you and not the person in an advert. Our job as Professionals is to have the knowledge and expertise NOT to steer you to a product, but rather to make sure that you can match your requirements, athletic ability and preferences to the benefits offered by new technology and new releases.Providing a personal solution requires a personal interaction; so come and chat to us. We are always here to talk about golf. It is what we do. Our job is to add the value of improvement to your golf and that is best done by allowing us the time to provide the most personal and best solution. Challenge us to improve your golf. Challenge us to make the game more enjoyable for you. You should be very aware of where on the face of your Irons you are striking the golf ball. Knowing that helps you determine what technology would help you hit the ball more consistently. Knowing it will also provide you with a good reality check of where you need to improve. equipment is supporting your swing when it doesn’t make perfect contact. I used to tell all the golfers I saw that they should carry a Gap Wedge because the manufacturers had increased the loft gap between the Pitching Wedge and Sand Wedge to 8°. Has that changed and has my advice changed? Manufacturers continue to try and add length to the distance you can hit the golf ball with every club in the bag. This has resulted in lofts becoming stronger. Makes sense doesn’t it. You hit this new #6 Iron as far as you used to hit your old #5 Iron. Actually the loft on your new #6 Iron could be as strong as your old #5 Iron. During the 90’s that led to Pitching Wedges strengthening to 48° leaving an 8° gap to the 56° Sand Wedge. That’s a two club gap. If you want to see the result of the last decade then check out the technical specifications on almost all the brands Irons. The Pitching Wedges have strengthened to 45° (and even 44° in a couple of examples). That is now a 3 club gap in your bag between the distance you hit your Pitching and Sand Wedges. I am not trying to sell you more golf equipment to carry in your bag (there is still a 14 club limit). 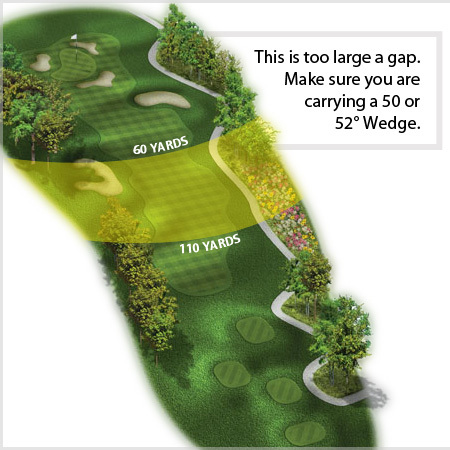 But you should give some serious thought to making sure you have a 50 or 52° loft Gap Wedge in your bag. If you don’t then you have too large a gap in your bag. If you are going to look at a Gap Wedge then make sure the bounce angle works for our course conditions and your swing shape. This entry was posted in golf, golf instruction, golf tips, sports and tagged golf fitness, golf plane, golf slice, out to in golf swing, peak performance. Bookmark the permalink.